I shared a powerful video by Ascension Press called “Will You Follow” a few weeks ago. It is a dramatic, vocation video aimed at teens, part of a soon-to-be-released five-part series called Altaration designed to enliven teens with a love and enthusiasm for the Mass. This 3-minute trailer for Altaration is extremely moving, thrilling actually. Mark Hart speaks in the power of the Holy Spirit. 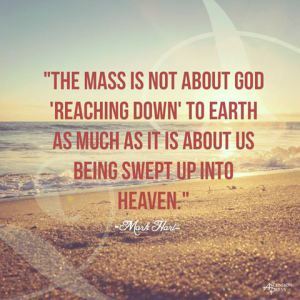 His words rang in my heart and lifted my spirits with fresh insights into the true meaning of the Mass. His words cast a fresh light on what is really happening on the altar and lit a new fire of love for the Father, Christ and the Eucharist within me. The video shows flashes of other young people and priests, real men, real role models who will appeal to teens.